Trunks: Short with low branches when in open areas, taller and straight when crowded; may be shrub-like in western areas of the state; 1-2 feet in diameter, often divided low into branches; branches stout, crooked, wide-spreading to ascending; crown open, unsymmetrical; bark gray or pale-brown; smooth on young trees; deeply-furrowed on mature trees; ridges thin, broad, rounded, often scaly. Twigs: Coarse, rigid, greenish or purplish, shiny, waxy, or finely pubescent; leaf scars crescent-shaped, narrow, extending halfway around twig; bundle scars 3; buds egg-shaped, 1/10 to 1/4 inch long, often minutely pubescent, as wide as long; blunt-tipped. Leaves: Opposite, odd pinnately-compound, 8 to 12 inches long; leaflets 3-7, egg-shaped or rhombic, 2 to 4 inches long, 1.6 to 2.8 inches wide; lateral leaflets narrower than terminal; upper surface yellowish-green, glabrous, dull; lower surface paler, pubescent on veins; margin coarsely and irregularly toothed above mid-leaflet, sometimes 3-lobed; tip pointed; base blunt or rounded; stalk slender, 2.4 to 3.2 inches long, often pubescent, base enlarged. In autumn, the leaves turn yellow. Flowers: Before or as leaves unfold; dioecious (male and female flowers on separate trees); staminate flowers 5-15, in drooping clusters; stalks thread-like, 1 to 2 inches long, greenish, pubescent; calyx bell-shaped, about 1/25 inch long, 5-lobed, yellowish-green, pubescent; petals absent; stamens 4-6, exserted; filaments long, slender; anthers large, red; pistillate flowers 4-9, in narrow, drooping racemes; stalks to 2/5 inch; calyx 5-lobed, yellowish, pubescent; petals absent; ovary green, 2-lobed; stigmas 2, long, slender, yellowish. Fruit: Early summer, but persist on tree until late autumn or winter; samaras in V-shaped pairs, spread at less than 90 degree angle, clustered in drooping racemes 6 to 8 inches long; each samara narrow, flat, winged, 1 to 2 inch long, about .4 inch wide, straw-colored; wing terminal, .8 to 1.6 inch long; seed body 1/2 to 3/5 inch long, 1/8 to 1/6 inch wide; stalks 3/5 to 4/5 inch long. Habitat: Stream banks, flood plains, shaded ditches, bottomland woods, ravine bottoms in upland woods, and planted around farmyards; moist soils. Uses: Native Americans boiled the sap to make sugar; steeped the inner bark and took the liquid to induce vomiting; and burned the wood as ceremonial incense. The Cheyenne burned the wood in Sundance ceremonies. The Dakota and Omaha used charcoal from the wood for ceremonial painting and tattooing. The wood was used to make bowls, trunk knots used to make drums, and twigs were made into prayer sticks. Comments: Box elder is short-lived and grows quickly. The branches are weak and break easily in strong winds. The wood is light-weight, soft, weak, creamy-white with a wide, white sapwood. It is often streaked red from a fungus, Fusarium negundi. The fungus is spread by sapsuckers and enters through wounds. Box elder wood is of little value and is used primarily as paper pulp or fuel. 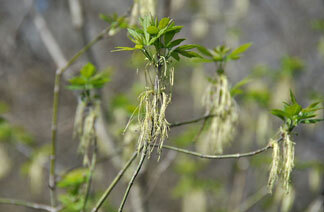 Box elder is known to cause allergy symptoms in the spring. It is susceptible to the box elder bug Leptocoris trivittatus.